Governor Deal, Pam Adamson is the Problem in Clayton County; Queen Pammie is Acting Like a Political Control Freak; Mark Elgart and SACS are Teetering on Silliness and Compulsive Obsessive Disorder Relative to the Clayton County Board of Education; and Other Laugable Matters! | Georgia Teachers Speak Out! ← Take Back Edmond Heatley? What?! Ha! The Media Wants to Know. Will Queen Pammie and Her Palace Allow the Prodigal Son Edmond Heatley to Return, Kiss Her Hand, and Form Another Government in Her Name? What Say Ye, Alieka? Ha! Yeah, You Sistas Have Got A Mess on Your Hands! Governor Deal, Pam Adamson is the Problem in Clayton County; Queen Pammie is Acting Like a Political Control Freak; Mark Elgart and SACS are Teetering on Silliness and Compulsive Obsessive Disorder Relative to the Clayton County Board of Education; and Other Laugable Matters! Well, well, well. I see that Pam Adamson is at it again. Acting on her own again…without the imprimatur of the school board as a whole. The school board members are only to act in concert with a majority of other school board members, but apparently Queen Pammie thinks that this only applies to other school board members. Ha! Pam Adamson’s recent diatribe is against “fellow board members” against whom she has apparently gone to the media, questioning whether Governor Deal needs to remove them. Wow. Or, “Nossa,” as they say down here in Brazil. She actually has the temerity to go to the media and question whether the Governor needs to remove some of her follow school board members. I’ll tell you who needs to leave the school board (and I think that the next election in 2014 will take care of this) is Pam Adamson. She is a political control freak. Note that it was her – and her alone – who met with soon-to-be-former superintendent Edmond Heatley about his abrupt resignation. This was out of order. Again, the school board chairperson has no power on her own to conduct any business whatsoever outside the collective action of the school board. She can’t act like she’s some kind of Clayton County Henrietta Kissinger. Oh…but this is where SACS comes in again. It appears that Glenn Brock has a cushy relationship with Mark Elgart. It appears that when a school system gets in trouble with SACS, ole Glenn Brock is the attorney that the school boards have to turn to in order get out of trouble with Markie Elgart. Damn! If I were a cynical man, I’d say that this might have the appearance of an unhealthy relationship. But, I won’t go there. Ha! So, when the Clayton County School Board members apparently start rumbling about not using Glenn Brock for another superintendent search, does it seem strange that all of a sudden Mark Elgart jumps back into the fray in Clayco? Do Mark and Glenn take the Clayton County people as imbeciles? I wander what really goes on behind the scenes. I wonder if Glenn and Mark have “ex parte” conversations about the Clayton County Board of Education. Hey Mark, how ‘bout looking into the admitted 57 illegal meetings of the Cobb County Board of Education? You know this school board, don’t you? I believe that this is the “primary” school board of the Brock & Clay Law Firm in Marietta. Didn’t it branch out into Cherokee, Fulton, Clayton, Atlanta, DeKalb, and Muscogee from this Cobb County base? Look what happened when political control freak Ericka Davis couldn’t get her way. She apparently got her lackey Vice Chairperson, Rod Johnson, to file a complaint with SACS. But, who was guilty of more ethical improprieties and micromanagement than all of the school board members? That’s right…Ericka Davis and her sidekick, Rod Johnson. But, when Mr. Norreese Haynes in great detailed answered any fallacious accusations against him with scores of evidentiary documents and then lodged a complaint of several legitimate accusations against Chairperson Ericka Davis and Vice Chairperson Rod Johnson, Mark Elgart, Georgia’s biggest educational phony and hypocrite, ignored Mr. Haynes’s detailed evidence of micromanagement and other egregious breaches of ethics and rather wrote a pitiful and anemic “Report” that was laughable. Norreese Haynes, on February 15, 2008 – the same day that the “Report” came out – wrote his response to this so-called SACS “Report” “a sham and a farce,” and it was. SACS is a scam, folks. As I have said over and over, it is a union for the school superintendents and an enforcer for groups like ALEC and other connected people. I submit to you that Glenn Brock, in my opinion, is one of those “connected” people. I believe that he and Mark Elgart have an unusual and perhaps unhealthy relationship for the school systems. It almost seems politically incestuous. It also seems that the only school systems which consistently end up in serious and consistent trouble with SACS are those school systems which are located in urban areas and thus are usually controlled by African Americans. It appears to me that SACS has a racial bent to it. Perhaps someone has it right. I read somewhere on a blog today that someone was suggesting going to the U. S. Department of Justice with a complaint about this private, money-grabbing organization which wields considerable influence over the public school systems but which has absolutely no accountability with the voters. 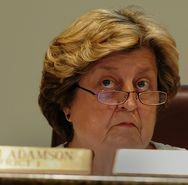 Then you have school board members like Pam Adamson actually suggesting that the Governor remove duly-elected school board members from office, thus denying the citizens of representation to the school board. Perhaps it is schemes like this that has 11 former Confederate states still under the mandate of the Voting Rights Act. Don’t get mad at me for just stating the truth. My Musing Yesterday on the AJC’s Get Schooled Blog About the General Assembly’s Efforts Through the Years to Improve Public Education in Georgia; the News that Mark Elgart is at it Again About Little Clayton County – Always Picking on this County; My Supposed Involvement in What is Going on With the Clayton County School Board; and Other Laughable Matters! Lee, it’s all about the money…or the lack thereof. It’s really not about the the kids’ or any real attempt to improve public education. In fact, I don’t think that the Georgia General Assembly would know educational improvement if it hit it right square in the face. Under the Gold Dome is where QBE (Quit Being an Educator) was hatched in 1985. What a complete failure! I campaigned against this doomed effort to improve education when I ran for the State House as a Republican in 1986 against then 30-year Democratic incumbent Bill Lee. Everyone else on the campaign trail in Georgia was singing its praises. All of the dumb-a$s programs to come down the pike since QBE have done more harm than good in public education. By the way, folks, these are the same folks to actually think that Michelle Rhee or Mark Elgart actually know what they are talking about. Do you remember my original list of the Four Biggest Educational Hypocrites in Georgia? Crawford Lewis, Beverly Hall, Edmond Heatley, and Mark Elgart. (I composed this list way before Lewis was indicted, Hall’s cheating scandal was nationally exposed, Heatley abruptly resigned in Clayton County thinking that he had a job in Berkeley, California, or a fairly thorough examination by the AJC of SACS’s somewhat dubious practices was published a couple of years ago.) I think that I have been proven right about the first three, and sooner or later the public is going to find out more and more about the hypocrisy of Mark Elgart and SACS. SACS is just a union for the superintendents and an enforcer for groups like ALEC and others who are well-connected. Perhaps those like Glenn Brock? I noticed in today’s AJC that Mark Elgart is snooping around again in Clayton County. He is concerned about “divisiveness” on the school board. (This man just doesn’t seem to like the democratic process.) Also, what came out was apparently his real concern…the school board is thinking of doing its own search for a superintendent and not using education attorney Glenn Brock’s “search” firm. Do you blame them? Glenn Brock gave them Edmond Heatley! Ha! Mark Elgart actually had the nerve to say that the school board did not have the “ability” or “skills” to select a superintendent. Wow. What hubris of this wannabe elitist! Perhaps he and Glenn could dine on seared Salmon and asparagus at the Piedmont Dining Club and choose another “great” superintendent like Edmond Heatley, Barbara Pulliam, or Joe Hairston. All three of these former Clayton County superintendents were selected by “search” firms and were disasters in Clayton County. I also noted from the comments made under the article that I am being blamed again for things going on now on the Clayton County Board of Education. Well, well, well… If the public only knew! Ha! I was being accused on controlling Trinia Garrett. Wow. I have never even spoken to this lady either directly or indirectly…via email, telephone, balloon, letter, Western Union, or in person. But, yes, I am the Big Bad Wolf. Boo! I haven’t lived in Clayton County in years, and I am currently in South America but I am so concerned about the goings-on of the Clayton County Board of Education that I am “controlling” it. Life is funny! For the record, Jessie Goree has never ever been a MACE member. We don’t tell who the members are, but I will gladly tell you who one is not and has never been, and this is Jessie Goree. I think that when she was a teachers in Atlanta, she was an AFT member. When she started working with the Clayton County School System, I believe that she joined CCEA/GAE. But, hey, thanks for the “influence” that you small-minded people are giving me. Ha. I say “small-minded” because apparently you only have room for me in your mind when it comes to the Clayton County Board of Education. I have known both Jessie and Michael King for a number of years, but I have also known Alieka Anderson quite a number of years and have been an acquaintance of Ophelia Burroughs for about ten years as well. We were involved in David Scott’s first run for U. S. Congress. Heck, for that matter, I helped Alieka Anderson when she first ran for office in Clayton County. I also helped Michael King when he made a couple impressive runs for the State Senate in the 1990s, but I can’t remember the last time that I have talked to Michael. Probably a few years. Actually, perhaps Glenn Brock and Mark Elgart think that I am encouraging this school board via long distance (yes, the computer and Magic Jack phones are amazing!) to make its own selections. Well, I hate to disappoint these money-grabbing lads, but I haven’t even given it a thought. It literally hasn’t even crossed my mind. I was simply glad to write perhaps a dozen articles against Edmond Heatley and his administration, and I noticed that the California newspapers quoted me rather extensively. I noticed that the Clayton Board of Education recently chose Luvenia Jackson to be the Interim Superintendent. I have known Luvenia for nearly 30 years. Does this too make her a “Trotterite”? Ha! Someone recently stated that he had rather be a Trotterite than not right at all! Well said. Ha! No, I am enjoying life. I work nearly every day for MACE, albeit sometimes from long distance. Right now, I am visiting Luciana and her family in Brazil. 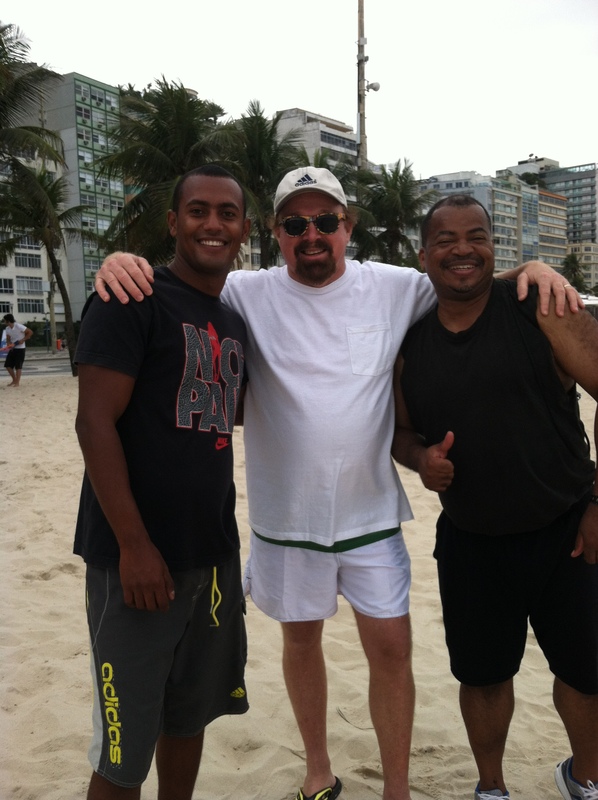 I am sitting at my computer just one block from the world’s most beautiful beach…Copacabana. But, the Lord willing, y’all know that I’ll be a’comin’ home soon. By the way, how did y’all like Victor’s come-from-behind victory in August? I got a little bit involved in the Runoff. Don’t think that I’ve sold’em all! Ha! I still know how to help folks get elected. Ain’t that why you hate me? Ha! Bootney, it’s raining down here, and I will spend a lot of time writing today. Lots of time. Perhaps I can work in “The Taxi School Solution” that I actually composed in congested traffic in a taxi last Friday night. These iPhones are great when you get bored in a taxi. Just take it out and start composing in the Notes section. This was meant to be somewhat whimsical, but in actually, the five points of The Taxi School Solution is, in mind opinion, a sound and practical curriculum and one that does not involve a plugged nickel of federal dollars. Yes, I think that we should disengage from the suffocating federal programs and breathe life back into public education. Freedom and creativity is what we desperately need. This private, “non-profit” profiteering money-grabbing company called SACS (Still Advocating for Cronies and Superintendents) won’t really do a darn thing to DeKalb County. It already dropped the atomic bomb on Clayton County and destroyed this community — and all over a Chairperson (Ericka Davis) not getting her way. SACS is a joke. It is really the union for superintendents. I believe that SACS works hand-in-hand with not-so-much-a-good-ole-boy-system but a select few effete and elite in this country who have determined that too much money (close to a trillion or more, I think, in total direct and ancillary costs) is going into public education. SACS is the enforcer for these peoples and groups like ALEC. Their tentacles are all over public education today, and their ostensible concern for public education is just that…ostensible. The real concern for these people and these groups is money. I think that this is the real concern for SACS. As long as it does the enforcement for these people (viz., scares the heck out of communities and school boards to keep them in line), then SACS is rewarded with loads and loads of money from the public troughs, and SACS’s CEO, Mark Elgart, continues to receive his close to one-half million in salary and benefits. AdvanED? Huh! MoneyED is more like it! It’s all a ruse, good people. All a ruse. SACS’s so-called standards mean nothing. They are always arbitrarily and capriciously applied, depending apparently on who receives the blessings of Zeus Elgart sitting atop Mount Alpharetta. I wish that the General Assembly would finally stand up to this educational phony, this educational Elmer Gantry and quit buying his snake oil. He’s like the man behind the curtain in the Wizard of Oz…or like Wisconsin’s Joe McCarthy before someone in the U. S. Senate finally stood up to this bully. Norreese Haynes and I have been speaking out against this educational hypocrite for about five years now. Our discordant sound has begun to pick up a few notes from the flute and tuba sections too. Mr. Haynes immediately called SACS’s flawed, biased, skewed, and laughable report on Clayton County “a sham and a farce.” He was right then, and we have been right on Mark Elgart and SACS ever since. I hope that no one thought that my earlier thoughts this morning were in defense of the DeKalb County Board of Education. I actually think that this school board and the school system appear pretty hopeless at this point…just like Atlanta’s. But, what did Zeus Mark Elgart and SACS do in Atlanta? Nothing. Nada. Not a darn thing. Why? Because the Big Mules apparently didn’t want ole Markie to do anything substantive. They just wanted him to get the irascible school board members who weren’t going along with Beverly Hall’s circus to fall back in line. What they (and their joke of a “blue ribbon” commission) didn’t take into account was Governor Sonny Perdue’s dandruff being raised by the Hall Administration’s arrogant and recalcitrant attitude. So, ole Sonny just lowered the boom on the Atlanta Public Schools (APS) and made it undergo a real investigation. We know what this uncovered…the biggest public school cheating scandal in the history of American Public Education, according to The New York Times. What did SACS do? Just sat on its thumb and looked stupid. SACS won’t really do anything to DeKalb County either. Why not do something about the DeKalb School System’s flagrantly and egregiously violating the Grievance Law (OGCA 20-2-989.5 et seq.) or the Duty Free Lunch Law for elementary teachers (OCGA 20-2-218)? Why not do something about the unconscionable behavior of the students who often curse out teachers in front of all other students with apparent impunity? Or, what about the students’ assaults and batteries against the teachers? Recently, a security guard was injured trying to break up one of the student melees at Tucker High School. These things are conveniently swept under the rug while Zeus Mark Elgart piously and hypocritically prattles away about “collaboration” among school board members. I am currently reading Bob Woodward newly-released book, “The Price of Politics,” which is about the gargantuan struggle of the Democrats and the Republicans on Capitol Hill in their fights over the federal budget and how they interacted with the Obama White House. These were real fights…you know, like democracy ought to occur. There wasn’t much holding of hands and singing of Kum Ba Ya. This “collaboration” standard is a joke. It takes away genuine debate. Debate among elected officials sharpens each side’s arguments and exposes them in the calcium light. I have no qualms about arguing and bickering on the school board. This is the American way, and I don’t know what planet Mark Elgart got off from thinking that everyone on the school board has to be exact replicas of Dale Carnegie and Amy Vanderbilt. I rather like the rascals like Hosea Williams and D. F. Glover. The problem that SACS apparently has with people like these are that the few and the select effete and elite who are not elected to anything but who really want to run everything behind the scenes (perhaps over grilled salmon and asparagus at the Piedmont Driving Club) don’t like these elected rascals. They are too irascible and pay no attention to this self-appointed gentry of Atlanta. SACS is a tool of these people. This is what is happening. It’s all about the money. What is the difference between the Atlanta Board of Education and the DeKalb County Board of Education? The Royalty of Atlanta – those residing on Tuxedo or Habersham or West Paces Ferry – still have a modicum of influence in APS. These people don’t send their children to the Atlanta Public Schools; their children and grandchildren attend Westminster, Marist, and Pace. But, they are concerned about taxes and who gets the contracts with APS. The only Buckhead business who seems to be getting any good business from the DeKalb Board of Education is the King & Spalding Law Firm. It appears to be making millions defending the school board in a case which, if the school board had just worked out a negotiated settlement with the construction company over change orders, etc., perhaps it could have saved millions of dollars in legal fees. And, of course, the Alston & Bird Law Firm has made a few bucks defending former superintendent, Crawford Lewis. Now, ole Glenn Brock and his firm, Brock and Clay of Marietta, have gotten in on the act. It appears that everywhere SACS goes snooping around, Brock and Clay ends up with a legal contract with the school board. Does Glenn convince the school board members that he can get the school board off the hook with SACS? Hmm.